Check out some lesser known facts from the beloved film. Harrison Ford was cast as Han Solo by Accident. Lucas had been looking for unknown faces that he had never worked with before, and initially brought in Harrison Ford- who appeared in his movie American Graffiti -to feed lines to the auditioning actors. He liked Ford's delivery so much that he caved and gave him the part. Orson Wells was almost Darth Vader. Lucas originally wanted him as the voice, but dropped the idea as he thought he would be too recognizable. The famous opening crawl was actually done with practical effects. They carefully placed 2-foot-wide die cut yellow letter over a 6-foot-long black paper background and the camera made a slow pass over them to mimic the crawl. It took 3 hours to shoot. Luke and Leia's swing across the chasm was real. Production couldn't afford stunt doubles, so Mark and Carrie were harnessed and swung across the platform 30 feet above the studio floor in one take. In early drafts of the screenplay, Yoda's name was actually Buffy. It was then changed to the full name 'Minch Yoda' before being shortened to just plain Yoda. Vader's reveal was kept a secret from nearly everyone. 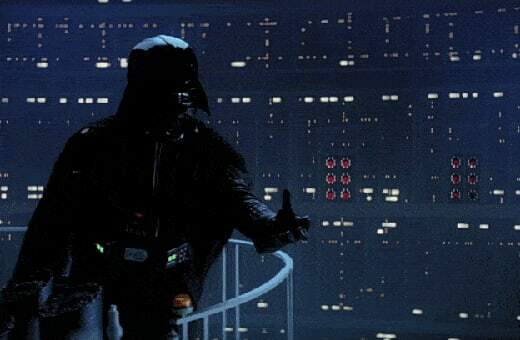 With false pages in the script, no one knew that Vader was actually Luke's dad except Lucas and two others. Mark was told moments before the first take, and the actor that was playing Vader in the suit would say "Obi-Wan killed your father," while Mark reacted the way that he did. The lines were added later when James Earl Jones recorded his lines. 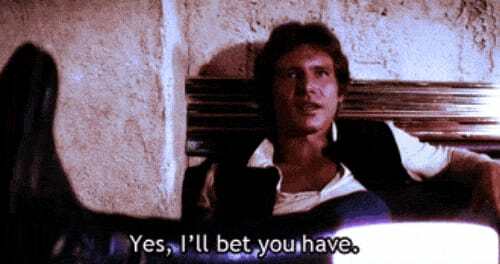 Han Solo was supposed to die. Harrison Ford only had a contract for two movies, and wanted to be killed off because he felt as though there was no where left for his character to go. Lucas disagreed, wanting him to come back and have a happy ending in the third movie with all the main characters making it out alive. They wanted someone famous for the unmasking of Darth Vader. Sebastian Shaw was a theater actor, writer and appeared in movies before taking up the role of Anakin Skywalker. The series almost ended very differently. After Vader dies, Lucas proposed that Luke would take the mask off of Vader and puts it on himself saying, "Now I am Vader." Lucas decided that he wanted a happy ending and the idea was scrapped. Hard to imagine now, with the fourth of May practically being a national holiday, but less than 40 theaters initially agreed to book showings of 'Star Wars' after the initial release day was moved to Memorial day as the studio thought it would bomb if it were a summer blockbuster. Fox was releasing another movie around the same time called The Other Side of Midnight and said that any theater showing it must also show Star Wars. As this act is actually illegal, Fox ended up being fined $25,000 after forcing the theaters to show the movies. No matter what, Star Wars will always be a classic. The Film Theorist Might Have Solved the Big 'Rogue One' Secret We've All Been Dying to Find Out! Revan Vs. Luke Skywalker: How Do The Two Star Wars Protagonist Compare?